The future is looking bright this week for Pomponio Ranch’s young horses. Headed into the second week of competition at Rancho Mission Viejo Riding Park, Kahlua PR (Uno de Laubry x Valeska) had a great week competing in the 1.20 and 1.25 classes, demonstrating her confidence and agility producing clear rounds. She is ready for the International Jumping Festival this week (Sept 20-24, 2017) and is available to try. She is ready for a junior or amateur rider. 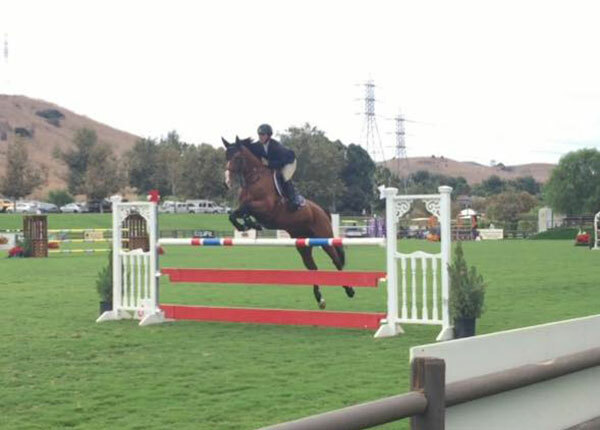 Also featured in this coming week at the International Jumping Festival, Nuage PR (Uno de Laubry x Gina) is ready for the 4 year-old Young Jumper Futurity. Day 1 of competition begins September 20 and the second round.